Off to best-buy to buy myself a new optical mouse. The fly-wheel should help with my spreadsheets. Will comment more when I get back. Wish me luck, hope the buggers are in stock. I want one. But I want a keyboard to go with it. And not Bluetooth if that is an option. Nice mouse m8, would be nice to see a review. Matt, I am going to wait for the m$ "ultimate" keyboard before buying one. bluetooth is ace, if you have other things that tie into it (i.e. my phone) so the hub really works wonders. I'll write up a review or something later. Probably just use stock pictures, cept when comparing my mx1000 to it. Verdict so far, I LOVE THE MOUSE. Damn thing is off-kilter, someone didn't pack it properly. Proper review when I return it and get another one. *claps* I wonder if it would work on the same (Bluetooth) receiver as my diNovo. Even though it wouldn't match the keyboard (that's bad). It seems like a regular RF mouse dude, not blue-tooth. Not that I care, RF has much better range. After some more fiddling around, the mouse if definitely ****ed. The entire section that holds the fly-wheel is loose. When I click it, my right mouse button is being hit by something on the inside. I am pissed off but its whatever. I'll switch it tomorrow. I wish there was an option for the search button linked directly to www.dictionary.com or www.thesaurus.com or something. Right now, google and yahoo are ok, but definitely not what I want for everything. Well worth it if you have some spare cash lying around. It is RF. But I believe Logitech makes the receivers backwards compatible. Im not a fan of logitech anymore. which does not work for gaming or anything at all i have disliked logitech. The keyboard is never connected and the mouse goes bizerks way too often. The mouse you got does look sick though. Actually my mouse has those buttons, dont know what they do, u have figured out that the arrows on the side are back/forward on the internet. I suppose you set the button to do whatever you want them to do. but the wheels, that's what I don't get,just more places to scroll from? and the slider...what the frig is the slider for? I bet its for gaming. 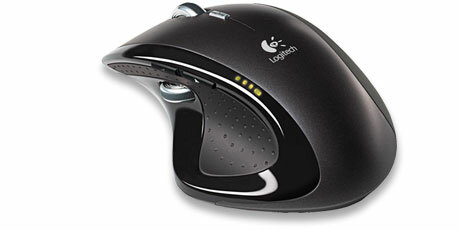 No, this mouse is not geared towards gaming like other Logitech mice. The button in the middle is a search function. Highlight a word or phrase then use this button to search using your favorite search engine. well then put a slider there and make it do something else too! Definitely a sick mouse, I have been looking for something new. I look forward for your review Saz. Shame the second wheel can't be used as a throttle. Or cas it. As for that split up the middle to form the 2 main pseudo buttons it is the devils curse to those of us crippled up with carpal tunnel. It requires additional force over real buttons causing repetitive motion damage when gaming. The second wheel is for that purpose.